So your Home has High Radon Levels…… now what? No matter how high your radon level is, your home can be mitigated and the radon levels in your home can be reduced. 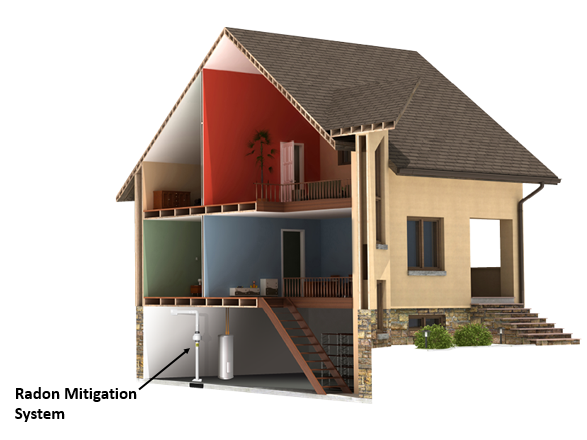 Radon mitigation can take different forms, depending on a variety of factors. That’s why it’s so important to consult a C-NRPP accredited professional to help with your radon mitigation. These professionals have the training and experience required to ensure that your home is mitigated safely and effectively. It is important to understand that in certain cases, depending on what systems are present in your home, a mitigation system that is not properly installed can lead to other health hazards, such as carbon monoxide poisoning. This is just one of the reasons to always consult a C-NRPP professional. The most common type of mitigation system is called Active Soil Depressurization (ASD). This system works by sucking air (and therefore the radon) from beneath the foundation of a home and exhausting it outside. Installation of an ASD system generally consists of drilling a hole through the concrete basement floor, and then attaching a pipe so that air can be sucked from the gravel and soil beneath the home. This air is pulled by a fan, and ducted out of the home through more pipe. The entire system is sealed, so that there is no communication between the system and the inside of the home. With air being constantly pulled from beneath the foundation, the pressure is lowered in the soil immediately beneath and around the home. Any radon gas that is present in the soil will be sucked through the pipe and exhausted outdoors, instead of finding its way into the home. Once installed, the radon fan will run constantly. Many radon fans are very quiet, and don’t make a noticeable amount of noise in the home. Some fans make more noise, but a C-NRPP certified mitigation professional will help you understand the design considerations and help you to find a solution that works for your home. After mitigation, many homes have radon levels that are comparable to radon levels in outdoor air. Additional benefits may also be reaped, such as less humidity in the basement, and lower levels of other soil gasses in the home. Suction Point: The point where the radon mitigation system passes through the basement floor. Below the floor, the pipe connects to the suction pit. Suction pit: Although you’ll never see it, the suction pit is an important component of the ASD system. In order to ensure that air is being sucked evenly from all areas beneath the foundation of your home, a suction pit is created by digging a hole in the soil and gravel beneath the floor of the basement. This method is an ingeniously simple concept that helps to increase the effectiveness of the radon mitigation system. The size of the pit is determined by the soil type, size of slab, and design of the mitigation system. Performing pre-installation diagnostics helps a C-NRPP professional to calculate the size of the pit required. Pipe: The pipe used to build an ASD system is Schedule 40 PVC pipe. The system can be installed using either 3” or 4” diameter pipe. This pipe is generally white or grey. This pipe is used because of its durability and its resistance to cracking. Maintaining a sealed system is important to ensure that radon doesn’t leak out and into the home. Fan: The radon fan is the heart of the ASD system. Radon fans are specially designed to be air-tight, quiet and efficient. Radon fans are built to a higher standard than some other types of fans because the radon fan case must be completely sealed. 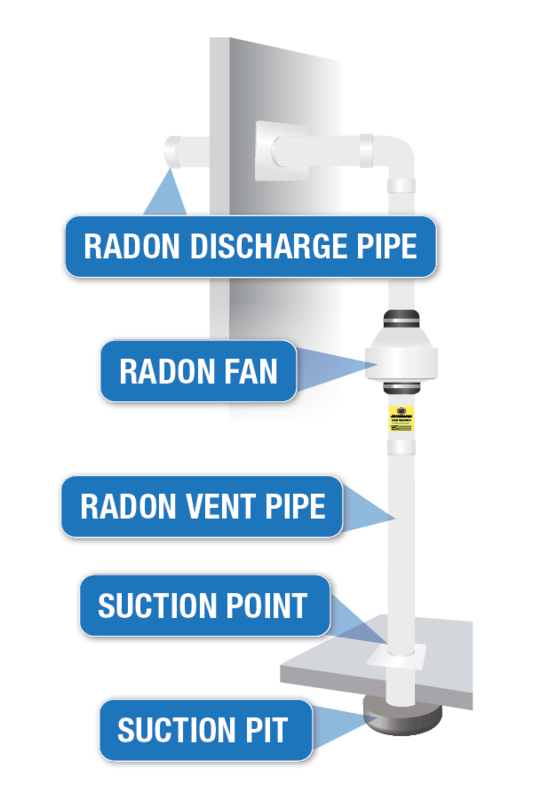 As with all other sections of the radon mitigation system, there must be no air leakage between the fan and the home in order to avoid radon contamination of the home’s interior air. C-NRPP professionals will only use radon fans that have been approved and listed by C-NRPP. System pressure gauge: Active radon mitigation systems have a system pressure gauge (often a U-Tube Manometer) that indicates the pressure in the piping system created by the radon fan. The initial pressure (indicated by the level of liquid in the tube) will be marked by the system installer. You should regularly check the gauge to ensure the system is operating properly. If the gauge indicates a substantial change (a 20% or more difference from the original marked pressure), or if it reads zero pressure (where the liquid in the tube is now level), your radon mitigation system may not be working properly and you should call for service. Sometimes, depending on where the system is installed, an electronic alarm is used. This alarm provides the homeowner with an audible alarm if the pressure of the system drops below an acceptable level. The electronic alarm is typically used when the fan is located in a location with limited accessibility, and viewing the System pressure gauge is difficult. Exhaust point: From the outside of your home, the only part of the radon mitigation system that will be visible is the exhaust pipe. This pipe usually exits the side of the house; typically from the area between the basement and main floor or above the roof level. In areas with considerable snowfall, the pipe must exit the home high enough from the ground so that it will not be blocked by snow in the winter. Your C-NRPP professional will also consider factors such as windows, decks, other air intake or discharge pipes in the house, neighbouring homes, and play areas when choosing the location for the exhaust pipe. Membranes – A plastic membrane may be used when a concrete basement floor slab is not present, or is not present in all areas of the building. In this case, a membrane should be used to provide a barrier seal between the building envelope (home) and the soil. The membrane can be added as part of a Radon Mitigation System called a Sub-Membrane Depressurization system. Sump Pit Cover: A tightly-fitted and sealed cover should be used over a sump or septic pit which is installed in a home. The cover must be properly fitted and sealed around the full area of the sump pit and sealed around all pipes and cords passing through the cover. Labels: the various components of a radon mitigation system should be properly labeled to ensure future occupants of the home are aware of the radon system. Radon rough-ins are required by the building code in Alberta, British Columbia, Saskatchewan, Manitoba, New Brunswick, the Yukon, Nova Scotia and some areas of Prince Edward Island. The recommendation for a radon rough-in came about in 2011, and was gradually adopted by these provinces. The purpose of including this pipe at the time of construction is to make it easier (and less expensive) for a radon mitigation system to be installed in the home if ever it is required. Radon Rough-in: Depending on the age of your home and where you are located, there may be a radon rough-in in your basement. The radon rough-in is a section of pipe that sticks up from the basement floor slab, generally with a pipe cap on top.